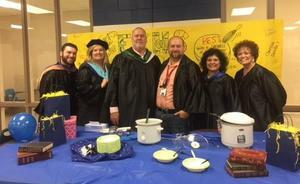 ECHS Teacher Scholars Place at LVHS Chili Cook-off! The team of Tia Barcelona, Charlotte Carlisle, Lee Kuhl, Bill Shuttlesworth, Josh Wucher, and Jan Hungate won third place for best chili and third place for best booth. Way to go ECHS staff!